No matter how beautiful a region is, at some stage we have to move on. 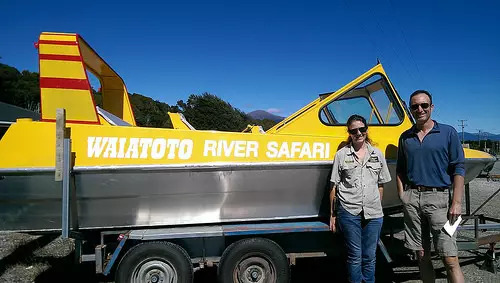 Check out these South Island itineraries that include Wanaka and Fox Glacier. There’s actually quite a bit to see between Wanaka and Fox Glacier -several highlights in fact. Here are just a few of them. 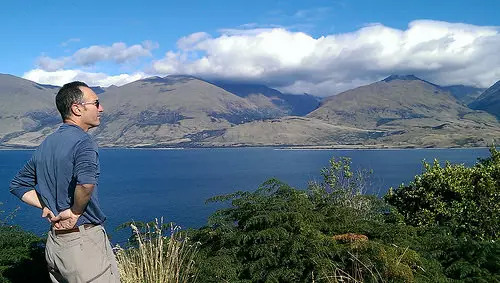 Lake Wanaka Lookout “The Neck”. 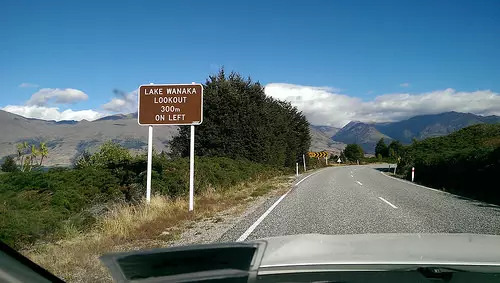 Our first stop is at the “The Neck” between Lake Wanaka and Lake Hawea. Over the last ice age two vast glaciers covered those lakes. The part in between – ‘The Neck’ – was the separator between those ice fields. Fortunately, there is a great lookout where you can safely pull over and take photographs. At times, this spot is terribly busy with travellers, so you need to watch out for people walking all over the place! In the peak summer season, you will need to pay attention as to where you stop. Don’t take photos on a bend in the road and I beg you, DO NOT stop in the middle of a busy scenic major road to study a map! Yes, I know its hard to believe people would do this – but we’ve seen it with our own eyes. 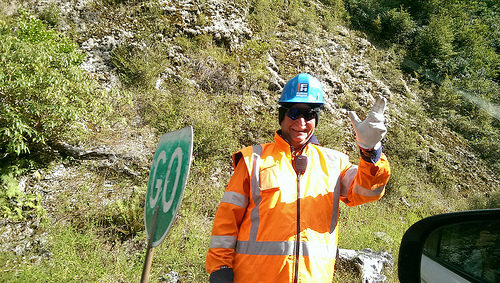 New Zealand roads are generally well maintained and occasionally you’ll come across roadwork gangs. This usually means only a 5 minute wait. Today, our stop was brief, mainly due to this entertaining worker. We enjoyed his deep bows and exaggerated movements as he waved us through. 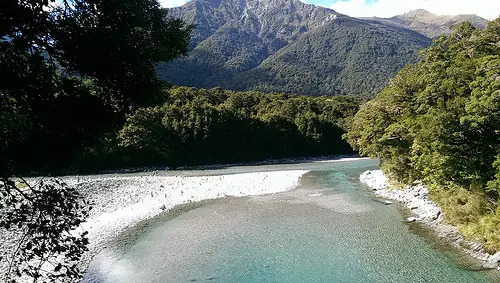 After a brief toilet stop at Makaroa, a 1 hour’s drive from Wanaka, head off to the famous “Blue Pools” on SH6. The Blue Pools are a major attraction in the Aspiring National Park. So expect a few people milling around. 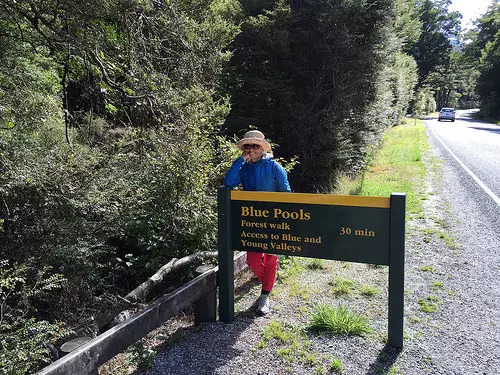 The forest walk to the Blue Pools is so refreshing and easy – Rifleman and Fantail birds flit around waiting for the small bugs you disturb with your feet. The walkway is well maintained and the swing bridge is manageable for everyone. The views are superb! 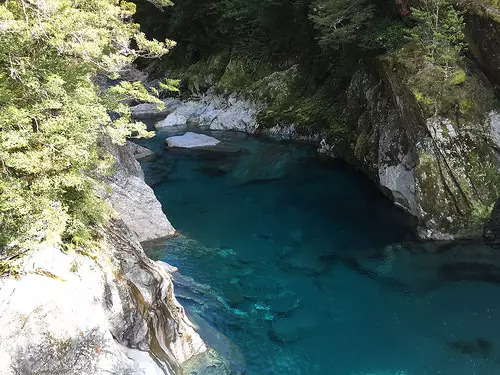 You’ll see the purest blue water stretching out towards the Makaroa River. So many angles with totally different views. 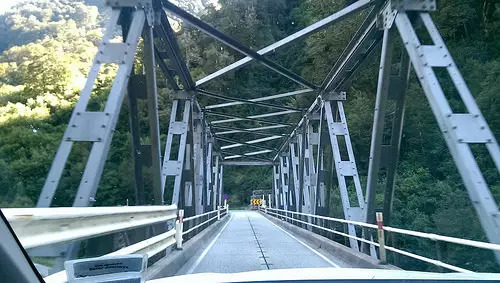 Once you’re back in the car, drive through to the Haast Bridge. This bridge is an impressive crisscross of steel girders – beautifully designed and very sturdy. You’ll soon enter the lush-green West Coast region. 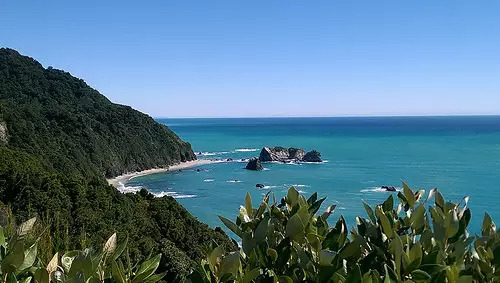 Drive south of the Haast Village to the starting point of Waiatoto River Safaris. This is a fabulous tour run by locals. 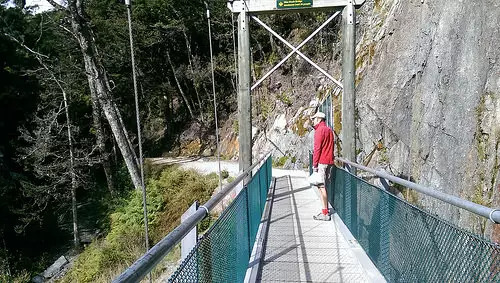 We think it should definitely be included in your things to see between Wanaka and Fox Glacier. The tour takes about 2.5 hours and will take you into a remote world heritage area . Today we met co-owner and tour operator, Ruth Allanson. Believe it or not, the West Coast can actually get beautiful sunny days. And on a day like this, you really have to at Shipwreck Creek The views are simply awesome. Here, you can take an easy stroll along a boardwalk to the beach. You can also visit Monroe Beach (rare penguins to be seen at the right time of the year). Do stop at the Knights Point Lookout. You simply can’t miss it out – yet again, it’ll be sensory overload! From here, you’ll pass Lake Moeraki and Lake Paringa. It is such a ‘breeze’ to drive this part of the South Island. There’s very little traffic and scenery is spectacular. Finally, you’ll pass through the tiny settlement of Bruce Bay and Jacobs Creek. The next stop is at the Fox Glacier Village. You’ll probably be having a stay here for a night or so, before moving on. 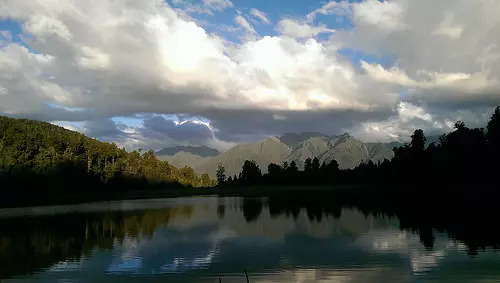 The early evening is a great time to see Lake Matheson. 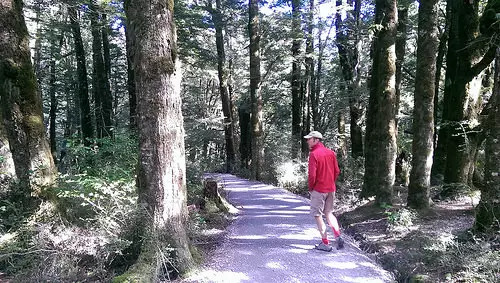 The Lake Matheson Walk is a great soother if you’re been driving all day. It’s incredibly tranquil. It basically involves a loop stroll around the lake. It is a perfect way to end a day discovering the things to see between Wanaka and Fox Glacier. Check out the second part of the West Coast travel journey here north from Fox to Nelson. Happy travelling the South Island between Wanaka and Fox Glacier! It is a most spectacular drive. I love the contrasts from the lakes region across the mountains to the West Coast and the lush green rain forest. Beautiful! Sometimes I miss out on seeing the landscape changing because I’ve looked through my handbag for something and by the time I look out I feel a though I’ve entered a time warp to another world entirely. It changes that quickly. TXS for this nice reminder of our NZ tour in dec 14/Jan 15… It was a stunning experience… Got addicted to NZ…. Hey Christa it’s great that visitors leave New Zealand with such precious memories. And yes, it’s also rewarding when visitors return. Hope you can too some day. Thank you so much for this informative post! 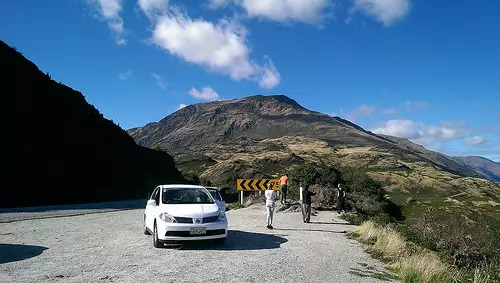 We will be making this drive on our first NZ trip in early October. This helps alot! Glad this blog has been of help Dee. You’ll love this country – the scenery is awe-inspiring. Have a great time!